When processing active pharmaceutical ingredients (API’s), containment is imperative. Not only does this protect the product from contamination, but it also ensures operators are protected from exposure to the highly hazardous materials. Due to the nature of the pharmaceutical industry, where product quality and hygiene are the absolute priority, it is necessary to use equipment that is easy to clean. When processing active pharmaceutical ingredients, this is often done in a contained environment. Russell Finex was approached by a leading pharmaceutical manufacturer to customize an existing sanitary vibratory screener, to make it more straightforward to clean inside a containment isolator. Previously, to clean the sieving machine, operators would have to enter the production area wearing a ventilated protective suit to avoid potential contact or inhalation of the pharmaceutical powders or dust. This, however, does not absolutely guarantee sanitation, as the equipment is still exposed to the surrounding environment, and contamination could be carried to other areas by the suit. 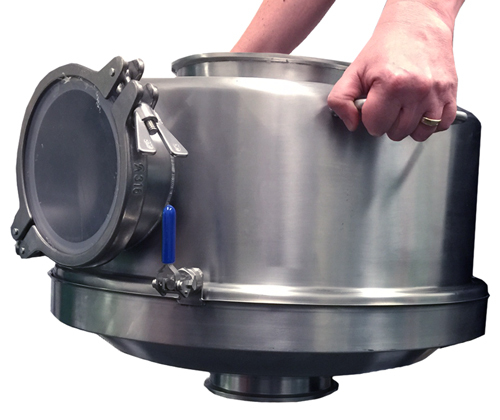 To eliminate this risk, the pharmaceutical manufacturer required a pharmaceutical sifter, customized for easy cleaning in a containment isolator. Following consultation with Russell Finex, it was agreed that the most user-friendly solution would be a Russell Compact Sieve® with an additional customized clamping system. This would allow transferral of all potentially hazardous contact parts to a containment isolator quickly and easily, with no risk of exposure to the operator. Additional clamps were added to the contact parts in question. When closed, the clamps keep the underpan, mesh screen and lid sealed together, and all parts can be carried jointly to a containment booth for cleaning. 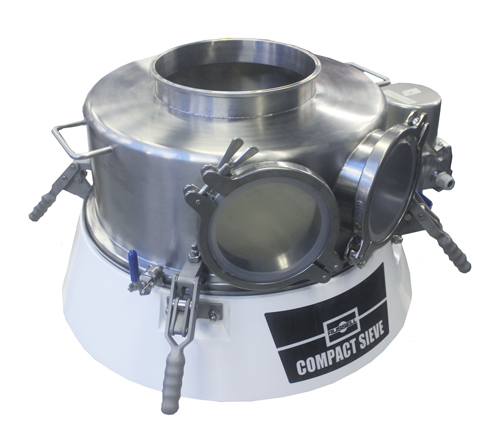 As the Russell Compact Sieve® is inherently an enclosed sieve to provide contained sieving during operation, these are the only parts that would be in contact with the API’s. Therefore, sealing these components together effectively contains the harmful material, meaning the exterior surfaces are safe to handle, and the sealed unit can be carried by the operator to a containment booth. Once inside the containment booth (or glovebox as commonly known in the pharma industry), the equipment can be easily dismantled by simply opening the clamps. As with all versions of the Russell Compact Sieve®, each component is easy to clean and re-assemble, meaning minimal production downtime. These compact vibratory screeners can fit easily into existing production lines. A wide range of sizes and options are available, and Russell Finex can customize machines to meet exact requirements of pharmaceutical applications. Established in 1934, Russell Finex has a wealth of experience in supplying leading manufacturers with customized pharmaceutical sieving and filtration equipment. With a customer base including Pfizer, GSK, Wyeth and Sanofi-Aventis, Russell Finex has built a reputation for providing high-quality solutions for high containment pharmaceutical powder processing. To find out how a customized upgrade such as this could optimize your maintenance or production, contact Russell Finex today.